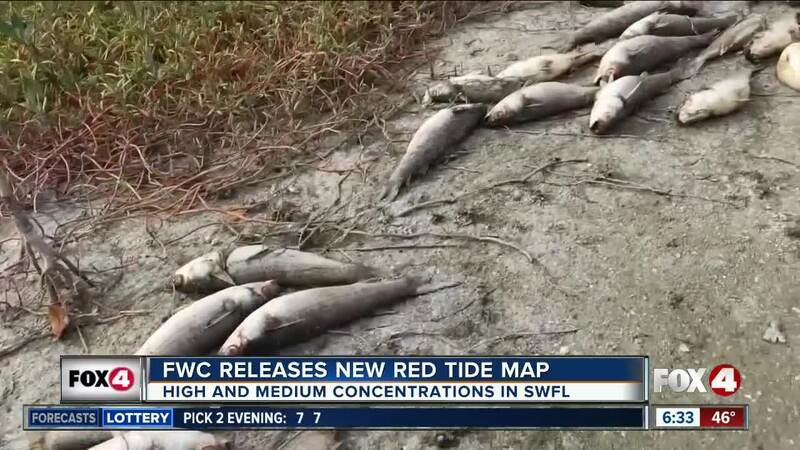 LEE COUNTY, Fla. -- Parts of Southwest Florida are seeing red tide blooms once again. The Florida Fish and Wildlife Commission released a new red tide map with the recent concentrations along the coast. Some areas have seen a decrease while other areas have seen higher concentrations of red tide. Charlotte County is the most impacted area. Scientists found high concentrations off the coast near Englewood Beach and medium concentrations near the Boca Grande Pier. In Lee County, there are low concentrations in Redfish Pass and Jug Creek. However, there are medium concentrations at Cayo Costa State Park and Captiva Pass. In Collier County, there were medium concentrations near the Naples Pier and Vanderbilt Beach. Compared to last week, red tide concentrations decreased in Charlotte and Lee counties. However, cell concentrations increased in other parts of Charlotte, Lee and Collier counties. Fish kills and respiratory irritation were also reported in Southwest Florida.